If you take anything away from this DraftStreet Review, it’s that we love the selection of games that they have. Pick’em games are great, but Snake Draft is how most fantasy players got started. We love both of these as they each have their opportunities to make better money than playing just a salary cap game. 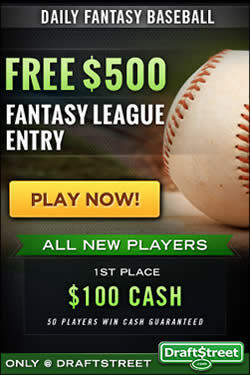 The whole process of signing up to DraftStreet.com, making a deposit and playing games is simple and quick. There is a large loyal player base community and they are always active in the live chat. We also like that when you join using DraftStreet Promo Code REALPLUS, not only to you get a solid 100% up to $200 bonus, you can then start to recruit players to play as well, making you money while you are making your own money playing at Draft Street. One of the best things that DraftStreet offers is their choices of games. Salary Cap, Pick’em and one of our favorites - Snake Draft are the types of fantasy games that can be played. With Salary Cap games, you pick a team using a set salary cap. Pick’em games give you 6 or 8 group tiers where you can pick one player in each that you think will be best of that tier. A Snake Draft is your traditional fantasy pool draft where you take turns making picks and it goes in reverse order each round. The same player can’t be chosen, so where you pick in the draft is very important. Here are some videos explaining the latter two styles. DraftStreet.com has games that range from FREE up to $2100. With every game that you play and win, you also accumulate DraftStreet Street Creds that can be cashed in for prizes or entries into bigger tournaments. Occasionally, DraftStreet will run a freeroll tournament as well, to help new players get a feel for the games and to have a chance to win some cash to start their bankroll with. We wish they even had more of these. 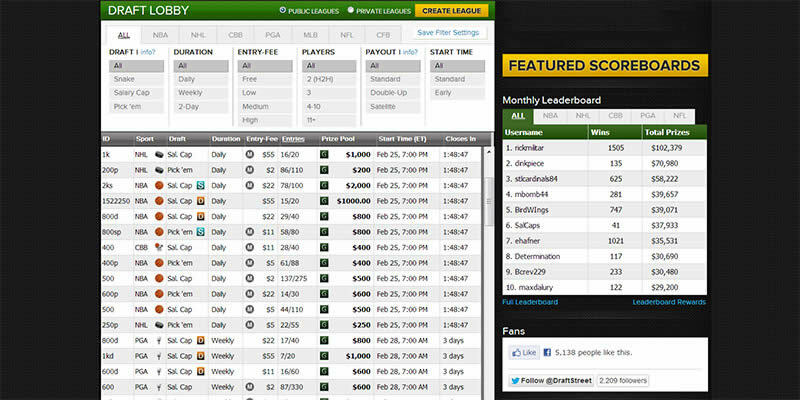 In our DraftStreet review of their interface we found the software to be, well…excellent! The games lobby makes it really easy to narrow down your game choices. First, pick which sport you want, then start to choose by games, entry amount, how many opponents you want to play and you can even filter it out further. It is really nicely laid out and is simply one of the best, especially for a new player. The home page layout is not perfect, though. The Monthly Leaderboard section takes up too much real estate on the home screen. 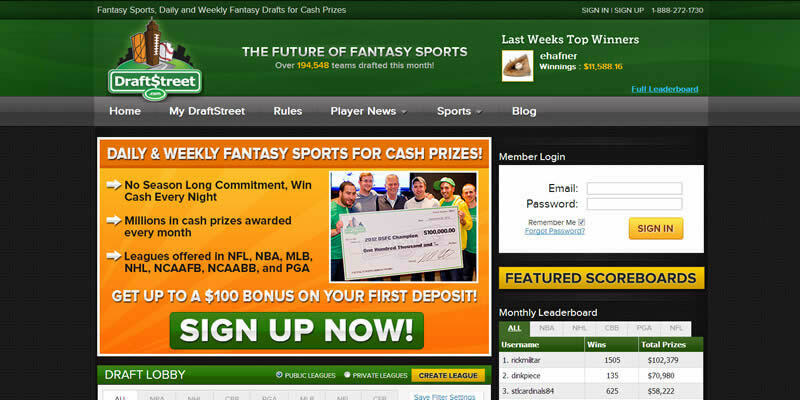 Admittedly, as much as we admire how much people are making playing Daily Fantasy Sports at DraftStreet.com, we don’t need it to be glaring us right in the face constantly. Also, Draft Street desperately needs a "Promotions" section laying out special contests and featured games. They try to do this by featuring 3 special events above the game selection area, but where there are more, good luck trying to find what you are looking for. Also, each event should have a page with the details laid out. 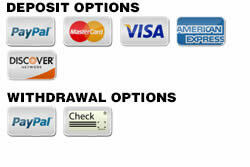 Making a deposit at DraftStreet is easy - PayPal, MC, VISA, Amex or Discover are all taken. When you are ready to cash in your DraftStreet winnings, PayPal or check options are available. Need help at DraftStreet?...No problem! Give them a call, email them, open a support ticket or talk to someone on their live chat. Support is quick to solve problems. We tested their abilities by asking about when the fantasy golf games at DraftStreet would be posted and one of their live chat staff got back to me to say that he would look into it...within a minute, I was told exactly when they would be posted. Sure enough, they were there at the time he mentioned. DraftStreet’s mobile site pops up when you login from your Android device, or from your iPad, iPad Air or iPhone. If you have a tablet, you can stay with the DraftStreet.com mobile site, or choose the full site option. With the DraftStreet mobile site, you can create an account or login, join a game, set your lineup and follow the action through their live scoring…in other words - you get the same fantasy experience on the DraftStreet Mobile Platform as you do on the DraftStreet.com full desktop site. 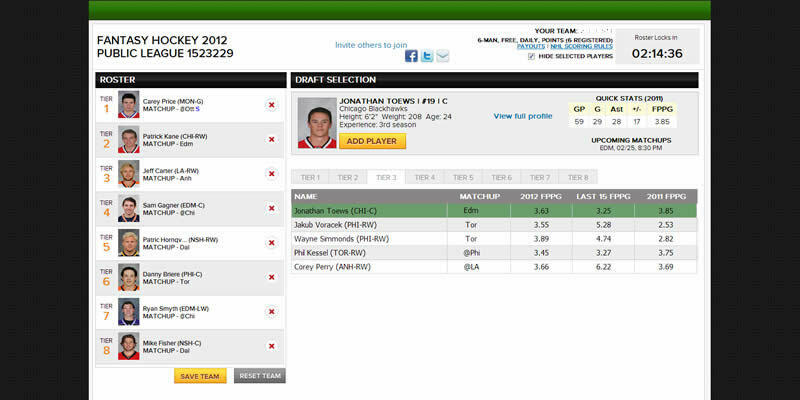 As mentioned thorughout our DraftStreet review, playing at DraftStreet is really easy and fun. We love the different game options and still find that you have the best chance of winning money playing Pick’em games. When deciding on a game to play, it would be nice if you could select your opponent. You can mouse over games to see who the opponent would be, but that seems like too much of a hassle. Getting rid of the Leaderboard on the home screen would allow for an expansion of the Games Lobby. When you select the game you are going to play, there are stats and news available for you to look over before you make a final player selection. Player’s salaries are pretty reasonable and creating a competitive team is fairly easy. The Live Scoring updates within a minute (if not quicker) for accurate scores, so you can follow your games and feel confident that the numbers you are seeing are real-time data.